One of the few artists to have been inducted into the Rock and Roll Hall of Fame twice, his other achievements include multiple Guinness World Records—including one for "Most Successful Entertainer of All Time" — 13 Grammy Awards, 13 number one singles in his solo career, and the sale of 750 million records worldwide. Jackson's highly publicized personal life, coupled with his successful career, made him a part of popular culture for almost four decades. Michael Jackson died on June 25, 2009, aged 50. Before his death, Jackson had announced a 50-date sell-out This Is It comeback tour, in London, England. 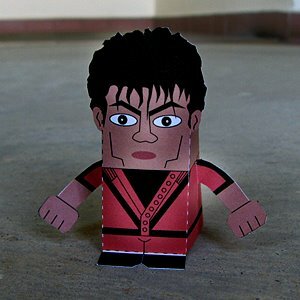 Download the PDF file here and make your own Michael Jackson! You can also get the blank template from our Facebook group and customize your own MJ toy! c'mon! there's a LOT to do to reach the 365 posts! I tried to do some on my on, but they sucked. All of your works are awesome! Such a fantastic idea. FANTASTIC!! JUST DISCOVERED YOUR BLOGS!